Re–keying involves replacing the small parts inside a lock, called pins or tumblers. This allows you to keep your existing door hardware, while rendering all previous keys inoperable. It's a good idea to re–key your locks when you move into a new building, let an employee go, or lose your keys. Master keying adds convenience to your building's locks. Each tenant or employee can be issued a key that will only allow access to their own offices. Building managers or janitorial staff may be issued a master key, which will open many doors. This reduces the need for carrying large and bulky rings of keys. Such systems can be set up with multiple levels of control, depending on the structure of your business. Commercial door locks can be expensive. If you have a lock that isn't working properly, it may just need a simple repair. Many problems can be fixed by disassembling the lock, cleaning and lubricating it, replacing small parts, or making adjustments. In most cases, this will be cheaper than replacing the entire lock. If a lock is damaged beyond repair, has become scratched and unattractive, or no longer meets your needs, I can replace it with a new one. 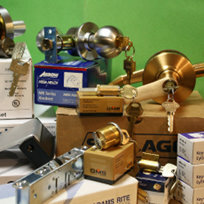 I have access to a wide variety of commercial door locks, from which I can find an appropriate replacement. Some businesses and organizations require large numbers of keys. I offer discounts for bulk duplication of keys in quantities of 50 or more, with additional price breaks at 100 and 250 keys. I have machines that allow me to produce up to 200 keys per hour, so I can often fulfill your large orders the same day. I can keep records of your keys on file, produce quality duplicates from these records, and deliver them to your office in a timely manner. Keys for filing cabinets, desks, and other office furniture are often lost or broken. I can replace lost or damaged keys, change locks, or make repairs to many of these small locks. Some facilities require many padlocks for gates, access panels and hatches, valves, electrical equipment, and lockers. Replacement padlocks are easily found at most hardware stores, but you'll often end up with confusing sets of multiple keys. I can order padlocks in sets that are all keyed alike. Some can even be keyed to match your building's keys or integrated into your master key system.